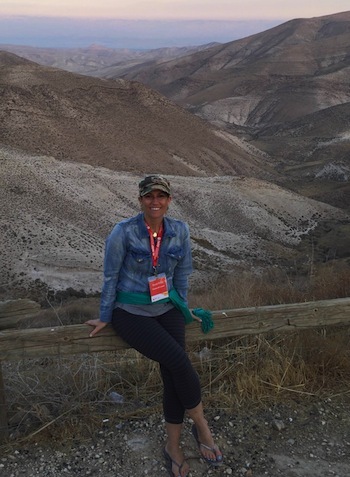 In its flagship program, Momentum, the Jewish Women’s Renaissance Project (JWRP) provides Jewish women and men, typically mothers and fathers, with a free journey throughout Israel (airfare is not included). The trips – the women’s and men’s trips are separate – are designed for people who are not shomer Shabbat (Shabbat observant). As well, 90% of participants must have children at home under the age of 18, and participants must be physically and emotionally healthy. Rebbetzin Lori Palatnik founded JWRP in 2008. Since then, it has become an international initiative bringing thousands of women and hundreds of men to Israel each year from 19 different countries. “The goal is that the women have 10 incredible, uplifting, inspirational days together … and then go home and bring that back to their families and communities,” said Toby Bernstein of the Chabad Romano Centre in Richmond Hill, Ont. These women joined 250 others from the United States, Canada, Russia, Greece and England. One of the participants was Nicole Pollak, a business owner in Toronto along with her husband, Aaron; the couple has a 3-year-old, Sydney. 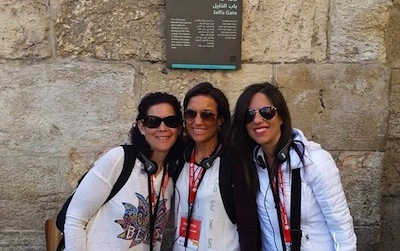 Pollak went on the trip with both of her sisters after her younger sister, Melissa Jacks, who sends her children to the Chabad Romano Centre, was invited to join by Bernstein. “My sister came to me and said that Chabad Romano is going to be running a JWRP trip and asked if me and our older sister, Allyson Theodorou, were interested in going,” said Pollak. “We applied, and all three of us went on this trip together. Pollak’s husband was very supportive of her going on the trip. When Pollak became anxious about leaving, it was her husband who helped push her through it. From the moment Pollak arrived at the airport, she could feel the camaraderie of the women traveling, all with similar feelings about leaving home, and she began focusing on the trip and getting as much out of it as she could. Each day of the program in Israel involved one or two discussions, lectures, lessons and classes, sightseeing and tours, and the opportunity to see something cultural or religious in the region. For Pollak, the learning was the best part of the experience. “One of the things we learned was that there are three major mitzvot for a Jewish woman: lighting Shabbat candles, making challah and going to the mikvah,” she explained. “We had the opportunity to light Shabbat candles and to participate in a challah-making class. And, on our visit to Tzfat, we visited a mikvah and had a tour. As for challah-making, the sisters have committed to getting together sometimes on Friday nights and making challah for Shabbat. As for the mikvah mitzvah, Pollak plans to investigate it more before deciding whether she wants to make it a part of her life. With respect to the sightseeing, visiting the Kotel was a major highlight for Pollak, especially after having had a class about prayer before going in a spot overlooking the wall. “I heard a lot of people saying … they don’t know how to pray, they don’t know what that means,” said Pollak. “People will often go to the wall and pray for world peace or for their entire family to be happy or healthy. They pray for these big things because they think that, when you talk to G-d, that’s what you ask for – big things. Another class that hit home for Pollak was one about judgment and perspective. In it, a story was shared that she has been telling people ever since. It was about a little girl who is standing in the kitchen with her mom, holding two bright red apples, one in each hand. As a result of the trip, Pollak has decided to find ways to live her life with more intention and more appreciation for her marriage, focusing on the positive things in her life, as well as understanding the responsibilities of being a Jewish woman in one’s home. “I think coming back made me realize that I have a responsibility bigger than I thought from a spiritual standpoint and that I’m going to live and work to do more of that,” she said. A Vancouver JWRP group is being formed under the auspices of Vancouver Torah Learning Centre for a July 17-24 trip to Israel. For more information, contact Devorah Brody via e-mail at [email protected] or visit jwrp.org.